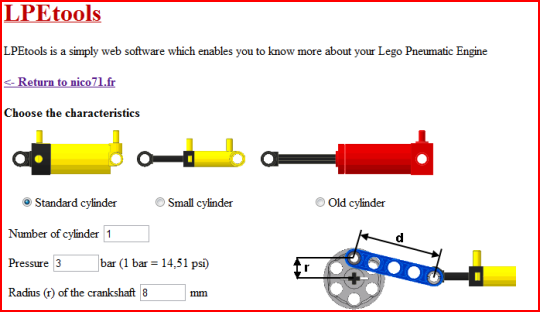 This new tool has been designed to help builders to know more about their Lego Pneumatic Engines. LPEtool manages all the important data : type of cylinder, number, switch, modified or not, dimensions… The tool calculates the maximun power (at maximun speed and pressure) and the average torque which varies with the rotation of the crankshaft. For instance, this classic LPE with 1 cylinder provides 1.3W of power whereas the Nicjasno’s 8 cylinder big block provides 100W, that is surprising but with 1500rpm and 6 bars of pressure, it is quite normal. If you have comment, question of suggestion, feel free to comment in this post. Have you made any laborations on what design the most powerful LPE should have? So according to this tool, LPEs are much more powerful than lego motors, this is great considering I want to make a car with one. Anyway, good job. I raised a question on the website of LPEpower about their 8-piston engine. My issue was that when you would have the engine running at 1500 rpm (at 6 bars), I think that you may approach sonic flow speed at the main air inlet of the engine (i.e. the first T-junction). This would limit the upper speed of the engine and may give high pressure drops over the tubings. What do you think about it? Is there a video or instructions for modifying the switches, because all I’ve managed to do is ruin them. 44Bricks Store – Buy your parts ! 2010 copyright Nico71 LEGO® is a trademark of The LEGO Group of companies which does not sponsor or endorse this blog.